The Jackson Career Explorer or the Strong Interest Inventory? When selecting a career assessment to help plan your future, you want to choose the test that will provide accurate results, a report that is easy to understand, and resources to help you. We compared the Jackson Career Explorer (JCE), our recently developed career assessment, with the Strong Interest Inventory, a test that was created almost one hundred years ago. The two tests differ in terms of administration time. The JCE takes approximately 20 minutes to complete, while the Strong takes about 30 minutes. The JCE is a shorter test, consisting of 170 test items covering 34 basic interest areas. The Strong has 291 test items and measures six interest areas. The JCE has the advantage of a faster administration time, covers more interest areas, and is less taxing on the test taker due to the smaller number of total questions. Both the JCE and the Strong use a five-point rating scale, having the test taker rate each activity from “strongly dislike” to “strongly like.” This allows for a broader range of expression from the test taker, and more accurate interest results. In the report generated upon completion, the JCE provides in-depth information on several occupations within the individual’s top three job groups. The Strong, however, ranks the individual’s top 10 jobs in order of compatibility, without splitting them into appropriate groups. 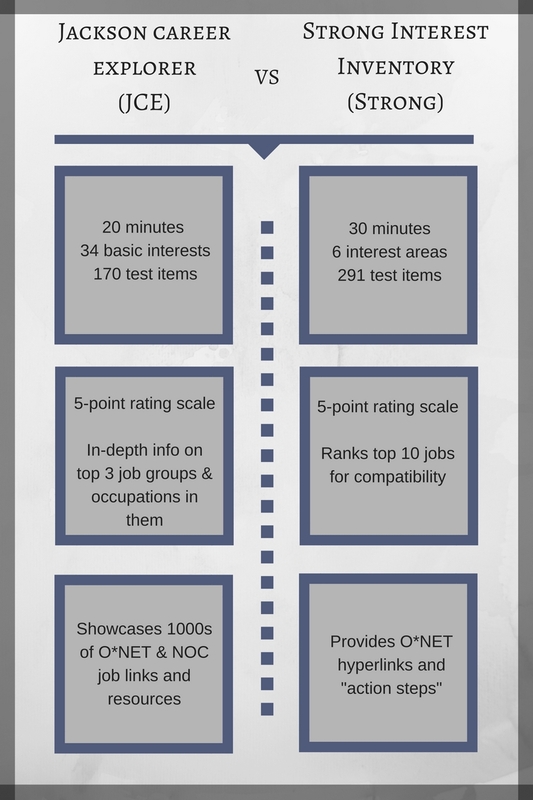 As part of its test results, the JCE offers the test taker a variety of O*NET and NOC job links and resources to peruse (thousands, in fact!). The Strong results are more limited, showcasing only a few O*NET hyperlinks and “action steps” the individual can take to start down their chosen career path. The JCE results are more informative and detailed, without being too complicated. When comparing the JCE vs Strong, which would you choose?